4am In Decatur is on the way. The opening scene of DJ Holiday and 2 Chainz's new video for "Wassup Wid It" is a look into the happenings on one Atlanta block at 4 a.m. on a Friday night: One neighbor is starting his day, others are ending their night, and still others are just watching it all unfold. 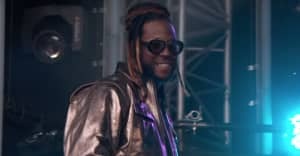 But 2 Chainz and DJ Holiday are there to make sure the entire neighborhood is lit up, as they perform the ominous track on top of an police squad car. "The "Wassup Wid It" setting is easily any random ATL neighborhood: nosey neighbors, random dudes outside smoking, and somebody creeping," DJ Holiday told The FADER over email. "4am In Decatur is a masterpiece, and I can't wait for y'all to hear it."